News and Announcements concerning Pure Warfare will be posted here. All Runescape News & Updates will be posted here for you to discuss and read! Want to take a look at what Pure Warfare has done in it's past? Look no further. Introducing yourself to Pure Warfare or departing from this community, then this is the place for you. General Discussion is the forum in which you can discuss near to anything related to Runescape MMORPG. In need of Runescape Help? Check inside this forum to see if we have what you need, if not, please ask! Post all of your Runescape guides in here for the public to read and use! Creating a fun event? Post it here! This section is for Non-PW Official Events. Show your kills, videos and other things relating to Player vs Player for the public to view and comment on! Achieved something good? Or do you have a goal in mind? Share them here. If you're looking for extra members for your clan, post your recruitment topic in this forum for the public to look at and decide which clan they're joining! All discussion relating to RuneScape Pure Clans will be in this forum but try and keep it friendly! Show off all of your fights ranging from mini wars to special wars to weekend events! Show off your graphics, request graphics or gain help relating to graphics in this forum! Do you believe you have the right artistic skills to win Pure Warfare's very own Signature Of The Month? Test them out and see how the crowd respond to your entry! Show off your Video editing skills and gain help here. 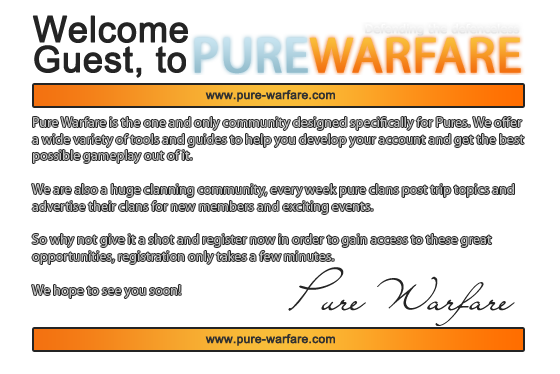 This forum is to give those who are new to Pure Warfare an insight into what it is about and the important things that can help them out! All topics not related to any other forum on Pure Warfare belongs in here. Debate any topic in this forum especially for this reason! Discuss upcoming games and consoles here. Discuss your favourite teams, upcoming tournaments and past victories here. Feel free to chat about the latest songs released, results from your favourite sports or discuss the television shows you enjoy! Most members ever online in one day was 381, last accomplished on 27 Feb 2012.